Awards and Honors: Prof. Mishra has 28 awards to his credit from various national and international organizations. Teaching: He has served as Lecturer in Sanskrit at Kendrapara College, Kendrapara (Odisha) during 1979-84, Reader in Sanskrit (1985-98) and Professor of Sanskrit (1999-2014) at P.G. Dept of Sanskrit, Utkal University. Administration: Prof. Mishra has held the position of Vice-Chancellor, North Orissa University, Baripada, Odisha, Director, National Mission for Manuscripts, Ministry of Culture, Govt. of India and Chairman, P.G. Council, Utkal Universiy, Odisha. 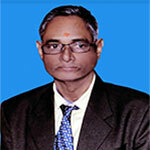 He has also held the membership of different bodies of Utkal University namely – Senate, Syndicate, Academic Council, Board of Studies, Subject Research Committees, University Examination Committee, Publication Committee, University Research Committee, Building Committee, Security Committee, Grievance Cell, IQAC, Finance Committee, Purchase Committees etc. of the University.